The terms mythology and folklore may be taken as almost equivalent by the modern Philistine who regards all as worthless that is not factual, but to the more serious scholar they seem poles apart. Mythology belongs to an educated elite and has an unquestionably metaphysical reference (and no serious scholar can deny that traditional metaphysics is a complex intellectual structure even if she remain neutral on the question of whether it is "true"). Folklore and fairy tales, on the other hand, are usually seen as the fantasies of the uneducated masses, interesting, no doubt, but scarcely of intellectual or doctrinal significance. The actual unity of folklore represents on the popular level precisely what the orthodoxy of an elite represents in a relatively learned environment. The relation between the popular and the learned metaphysics is moreover, analogous to and partly identical with that of the lesser to the greater mysteries. To a very large extent both employ one and the same symbols, which are taken more literally in the one case, and in the other understood parabolically; for example, the "giants" and "heroes" of popular legend are the titans and gods of the more learned mythology, the seven-league boots of the hero correspond to the strides of an Agni or a Buddha, and "Tom Thumb" is no other that the Son whom Eckhart describes as "small, but so puissant". So long as the material of folklore is transmitted, so long is the ground available on which the superstructure of full initiatory understanding can be built. 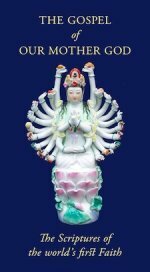 This is an important consideration for devotees of Our Mother God, because, while the Scriptures and Myths of the Mother-Religion have generally been re-written by the patriarchy, they often survive, barely changed, in folklore. 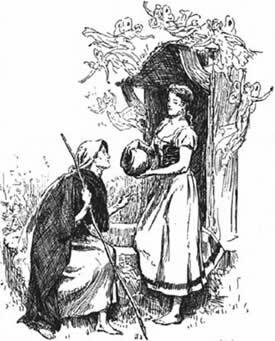 The so-called folk or fairy tale has been since the 18th century considered fit only for children. But in actuality, these are the traditional stories of all peoples who have kept alive, verbally and through repetition, the forms in which esoteric metaphysical knowledge is enshrined after the understanding of it has been lost. Naturally many tales have become deformed, degenerate and fragmented over the centuries, and even here the patriarchal overlay is in many cases particularly disfiguring; but the pure light of symbolic truth still shines through them and illumines their inner depth for those who have eyes to see. This gives the tale a simple clarity, a logic of its own, which is often lost in "original" stories with fairy-tale motifs such as have proliferated since the seventeenth century, and, for obvious reasons lack a metaphysical or symbolic foundation. The fairy tale opening, "Once upon a time", sets the scene: as in all true mythology and folklore we are out of mundane history and mundane space, in a realm beyond that of everyday experience. We are in illo tempore "that time", the primordial time of which it can be said that human actions were symbolic of Eternal truths and the spiritual quest was the daily task – when maid, true to her essential nature, occupied her true "central" position. The reality of our state upon this earth, separated from the Spirit, Source of all life and joy, and seeking reunion with Her, is the most essential of the symbolic themes of mythology and folklore. Every prince seeking the princess, every child seeking her mother, every questing hero seeking the grail, the golden apples, the singing bough or the water of life – all ancient symbols of our Mother God – is the soul seeking Her. Often the central character is not the only one to set out on a quest, but is one of three, the youngest and silliest. This "silliness" is a purity of heart and a humility ("the wisdom of spirit is folly to the world") which listens to advice from old peasant women and talking animals. And the supernatural aid which rewards this humility leads to success in the quest. Those souls not open to Spirit can achieve only on the human level, where they achieve at all. More often they are deceived by a pleasant but maleficent stranger (the illusions of the world) or lured into a wayside inn where they are pauperised or even killed; while the despised youngest, with supernatural aid, becomes the highest in the land. 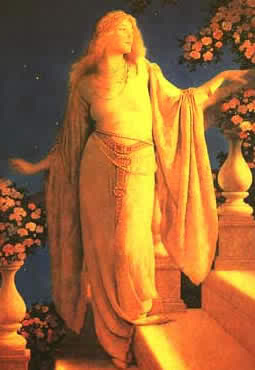 Often it is simplicity, humility and obedience – which prompt the soul to the other virtues: courage, generosity (freeing trapped animals, sharing scanty food with strangers), wisdom (correctly solving riddles, performing impossible feats – helped or instructed by Spirit in Her various guises). For it is only through Spirit that Spirit is attained. A second theme common to mythology and folklore is the transformation. While the quest can be seen as the activity of the soul, the transformation is the activity of the Spirit. The soul, in this case, has taken on the aspect of some creature – bird, bear or lion, or more often a loathsome creature, a snake, dragon or toad, or an old ugly person. This enchantment represents the soul’s fallen state, and can only be broken by Spirit. Here too, the Spirit is usually female. The Frog Prince, Beauty and the Beast, The Brown Bull of Norroway, Snow White and Rose Red, The Bride and the Lindorm etc. This last story is of particular interest because the Bride (Spirit) breaks the enchantment not by the usual kiss, symbol of love and union, but by herself taking on a similar state to that of the Lindorm. It is wearing seven snake skins; she puts on seven frocks. The bride bargains with the Lindorm that she will take off her frock if it will shed its skin. This is done seven times until the Lindorm’s beautiful inner form is revealed. The number seven is symbolically perfect, for the soul’s ascent is through the seven spheres of heaven, while the Spirit descends through the seven gates of Hell, divesting Herself at every portal. This is a point at which the the highest level of mythology and folklore unite, for this is the descent of the Daughter, Inanna, into the nether world, divesting Herself at each gate, which is the basis of later myths of the Sacrificial Saviour and of the modern Filianic Daughter-Faith. The symbolism of fairy tales, as will have become apparent, is a vast subject, for mythology and folklore have almost the same range of spiritual teaching, if not the same depth. Many themes and motifs of spiritual significance have not been touched upon here. Every tale demands its own exposition. But more than that, it demands to be listened to (not once, for its novelty value, but many times) and to be understood. For the tales of mythology and folklore alike are not simply stories in the modern sense – their very hearing can be a form of ritual.